MobileAssist™ is a FREE App for ALL End Users. The App provides the user with one-click access to all commercial, government, and non-profit organization’s communication channels via this single mobile app. 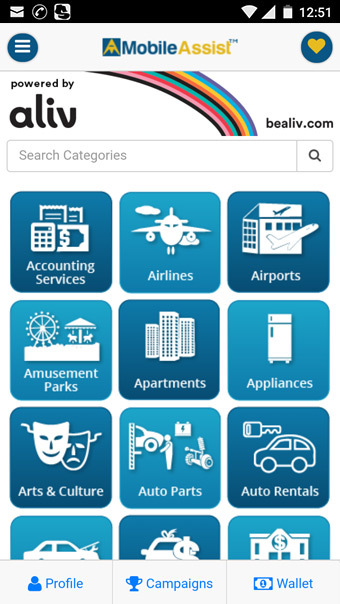 There are sixty (60) different categories in which businesses, and organizations can be listed in the MobileAssist™ App. 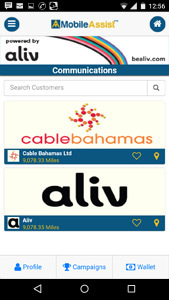 Users can search by name or scroll to find the specific company or organization listing they are looking for. Users can see the location of the listing in relation to their current location, favorite the listing, or obtain turn-by-turn directions. 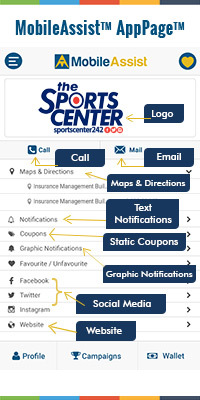 The MobileAssist™ App provides a menu of features and functionality that allows the User to customize how they use the App. Users can easily access information that is important to them based on their personal preferences. Promotional campaigns such as Scratch & Win can be accessed via the My Campaigns function. My Wallet allows the user to purchase MobileAssist™ Credits within the app using a debit or credit card. Credits can also be purchased/TopUp in person at any Omni location.